Thereafter, three different AP methods of payments are setup – one for each bank account. 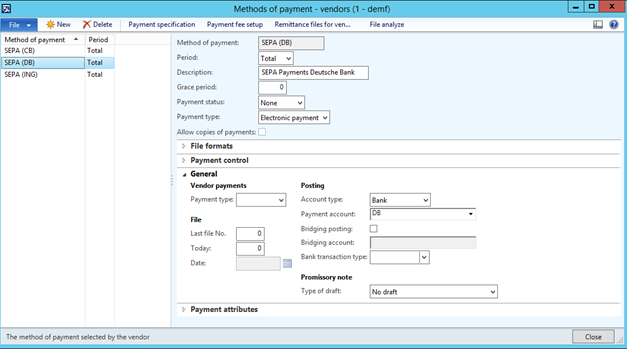 Based on the assumption that payments will primarily be made from the Deutsche Bank bank account, all vendor records are setup with the default “SEPA (DB)” method of payment. After finalizing all the setup, a number of invoices is posted for the vendors DE-002, DE-003 and DE-004. 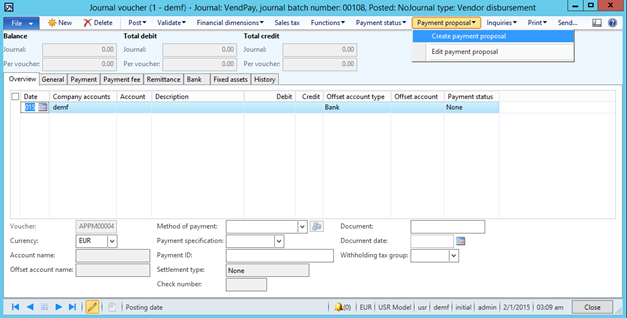 After posting the different invoices a payment proposal is created in a vendor payment journal. 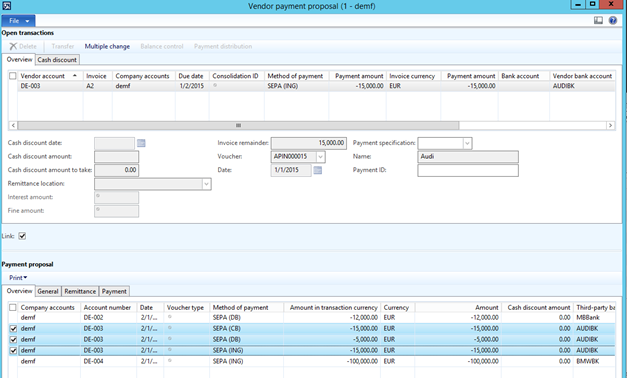 The result of this payment proposal can be identified in the vendor payment proposal form. 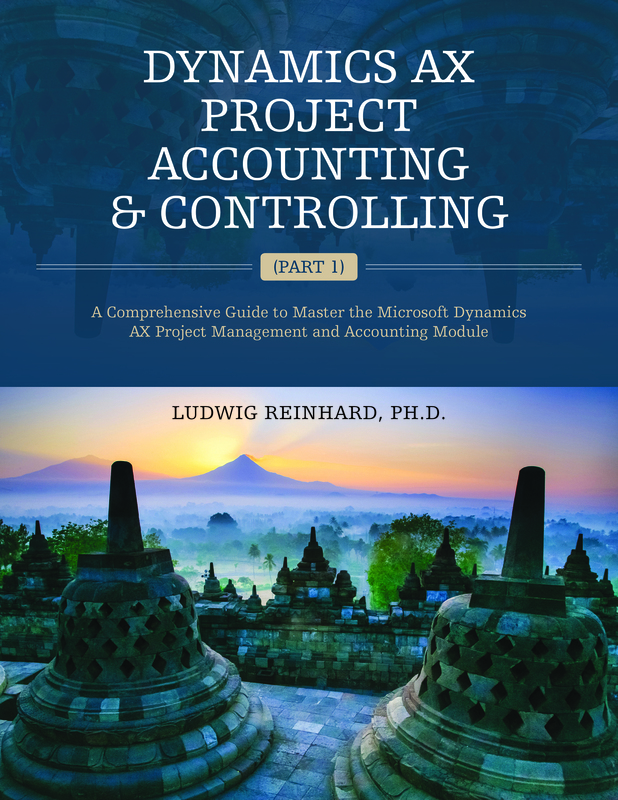 As one might expect, Dynamics AX suggests paying all invoices from the Deutsche Bank bank account because previously the SEPA (DB) method of payment was setup as the default method of payment for each vendor. This can be identified from the lower part of the following screenshot. 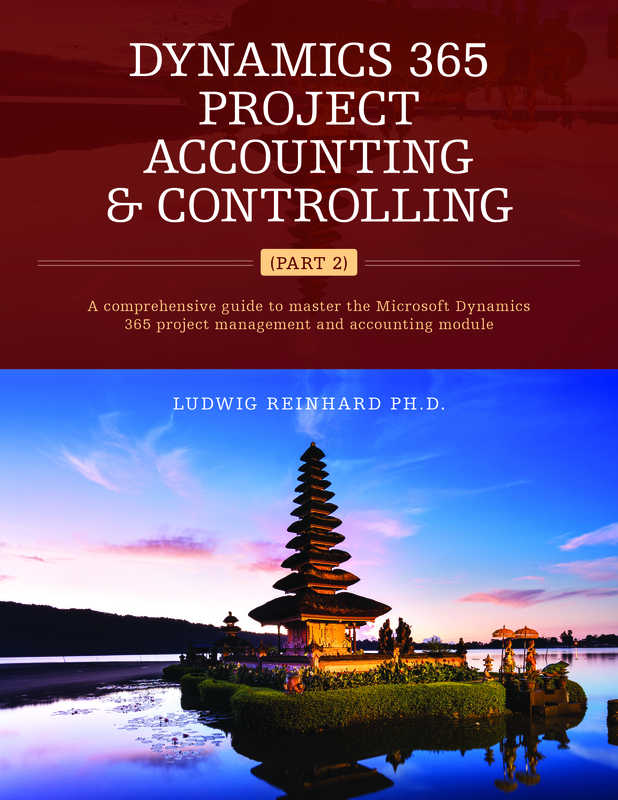 If you open the balance control window you can identify that all invoices cannot be paid from the Deutsche Bank bank account because paying all invoices from this bank account would result in a negative balance of 117000 EUR on this account. 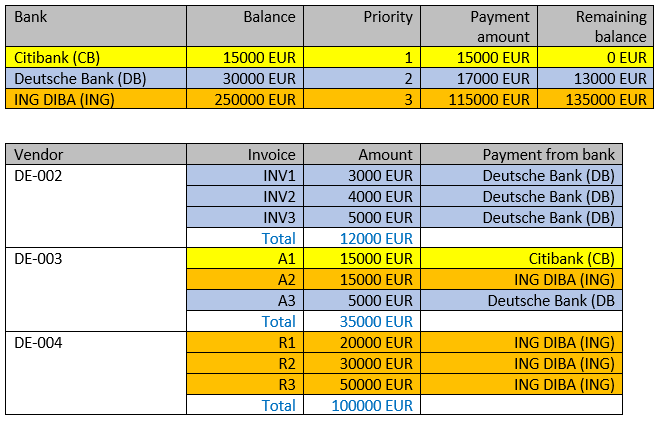 To avoid this negative balance, the following payment priority is specified in the last column of the payment distribution window. 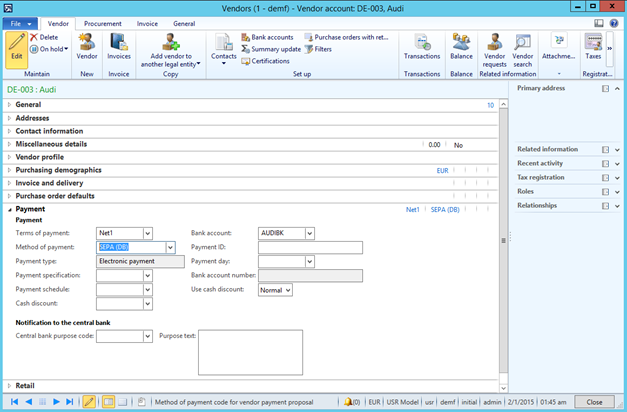 The priority specified defines that vendor payments should primarily be made from the Citibank bank account. If funds on the Citibank account are insufficient, money from the Deutsche Bank bank account shall be used and so on. 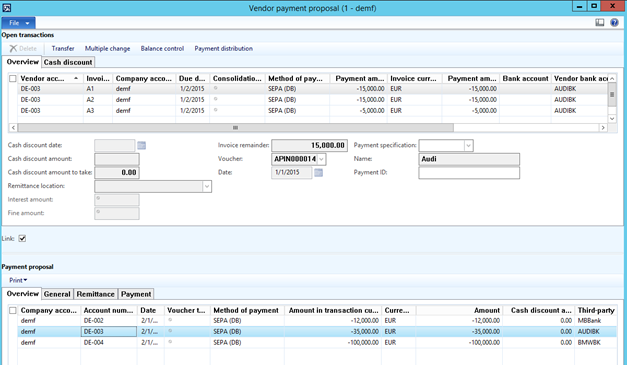 Leaving the payment distribution window with “OK” results in the following changed vendor payment proposal. 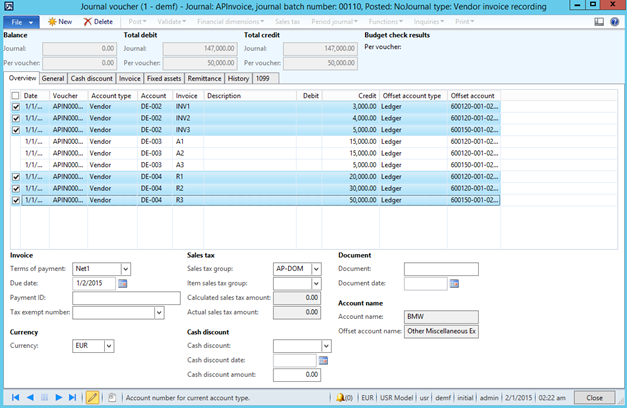 As one can identify from this window, 15000 EUR will be paid from the Citibank account to pay an invoice of vendor DE-003. From Deutsche Bank another 17000 EUR (12000 EUR + 5000 EUR) will be paid and the remainder will be paid from the ING DIBA bank account. 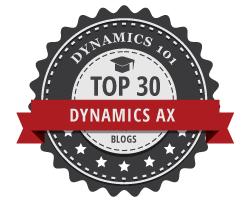 The following illustrations summarize how Dynamics AX distributes the payment amounts to the different bank accounts. 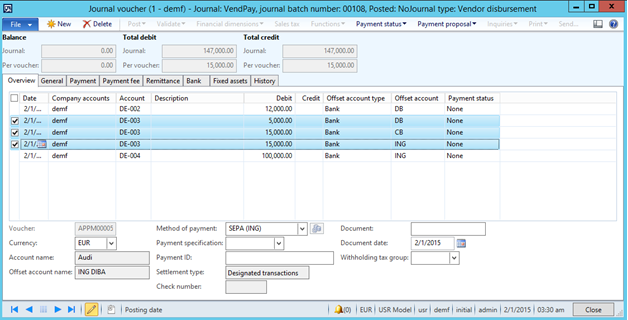 If you confirm the payment proposal by clicking the transfer button, the payment lines will be transferred to the vendor payment journal where you can create your payments and post the journal as usual.